Green garlic is the tender, young garlic that is harvested before the familiar bulb fully develops underground are called green garlic. 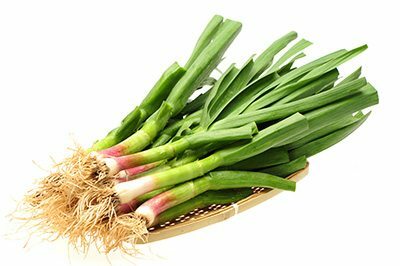 Also known as spring garlic, it resembles a scallion, green onion or leek but yields an aromatic, delicate garlic flavour. It has a strong garlic scent with a mild, fresh, herb-like flavour. When harvested in mid-May a unique garlic flavour is present along with the highest nutritional and nutraceutical plant properties. Use it in the place of garlic, green onions or scallions. Great on a salad. Most people cook with the white and pale green parts, but you can use the tougher green tops in broths or the like. With eggs (omelettes, scrambled eggs, quiche). Storage: Refrigerate in a plastic bag, or stand upright in water with a plastic bag around it. Health Benefits: Green garlic offers many of the same health benefits of garlic including the well known immune-boosting qualities. It is rich in iron, has anti-bacterial and anti-inflammatory properties, 150 calories/100g. Where to Purchase: You may purchase garlic scapes in season (mid-June to mid-August) on our website and have them shipped to your home. You may also find our scapes in your local Loblaws, Sobeys, Farm Boy and/or Metro stores.